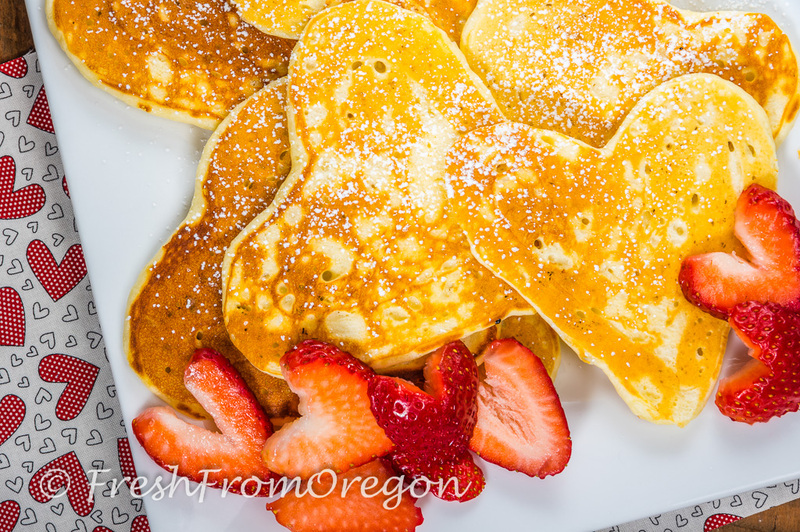 With Valentine’s coming up next week treat your sweetheart or family with some heart-shape pancakes. Make them mini or big they will bring a smile to everyones face. Make it extra special and cut your strawberries into heart-shapes and do not worry if the hearts are not perfect because hearts come in many shapes and sizes! Preheat flat top grill or pan to 400 degrees. Make the buttermilk pancake recipe above and place half of the batter into the bag. Do not over fill the bag it will make it hard to make your heart-shapes. Once the grill or pan is hot enough cut off the end of the bag to get about a 1/4″ opening. Be careful to hold the cut side up so the batter does not start to spill out. With the bag of batter make the outer shape of a heart and then fill in the center with more batter. You might want to practice a few first. Do not worry if the heart shapes are not perfect. Once you start to see some bubbles on the top of the batter take a peek with a spatula by lifting a corner to see if the bottom side is a golden brown color. If it is flip over the pancake. Cook another 2 minutes and the pancakes are ready. If you want to keep them warm place in a preheated 250 degree oven on a baking sheet. You are now ready to add your goodies and enjoy!